The Bits In Glass (BIG) DocuSign utility brings DocuSign’s industry-leading functionality into any application built on the Appian Platform. The utility provides a re-usable integration that speeds development time by giving Appian Designers plug and play functionality, enabling them to quickly and easily integrate DocuSign into applications. 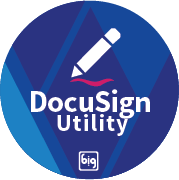 Providing a full range of functionality, developers can rely on the BIG DocuSign utility to handle all aspects of the signing process, from signature requests all the way through to follow up communications. Signatures can be requested from within the Appian application by generating embedded signing ceremonies or by utilizing DocuSign’s native email functionality to alert an outside user that a signature has been requested. Documents to be signed can be pulled from the Appian application, DocuSign platform, or uploaded directly from desktops or servers. DocuSign communicates with Appian to start a new workflow once the signature request has been completed. Any user can be requested to sign and execute a signature. You only need an email address to request and process a digital signature. Watch the demo on demand here.